Add comfort to your craftings and to your interactions with the chests. 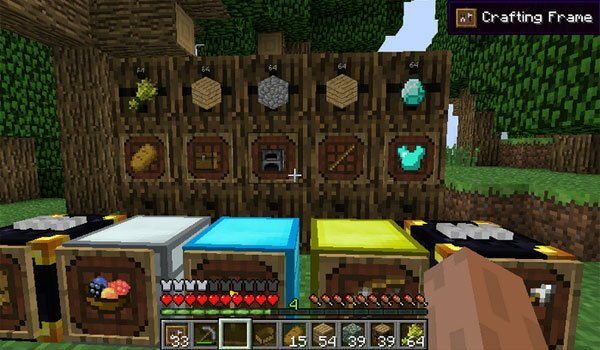 Super Crafting Frame 1.11 and 1.10.2 is a mod that adds just only two objects by the moment. In one hand we have the “Super Item Frame”, a frame that can be placed on the chests and where we can display the contents of that chest, placing the object within the frame. With this, we can add and remove units of that block or object, without having to open the chest , because it automatically will give or introduce the object inside the box. If you want to take an stack, you have to do twice right click, that simple. As a second and final object that we have the is the “Super Crafting Frame”, another frame that can be placed in any block. In the frame, drop automatically the object you want to craft, and if the material for this craftings is available in your chest, you will be given that crafted object with just clicking the frame. How to install Super Crafting Frame Mod for Minecraft 1.11 and 1.10.2? Quick interaction with chests and automatic craftings!